Swamp Boys BBQ is a Winter Haven, Florida based nationally ranked professional competition barbecue team. Honors include, top 5 team in the Florida BBQ Association (FBA) in 2006 and 2007, Team of the Year in 2008 and 2009, and have been in the top 3 since then. We were ranked the #1 team in the country for 67 straight weeks, including all of 2009, by the National BBQ Rankings. We were ranked #1 nationally again in 2013. We compete primarily in the southeast – FL, AL, GA, SC, NC and TN in both FBA and KCBS contests. We have won over 60 Grand Championships and over 45 Reserve Grand Championships. We won the World Championship in Pork Shoulder. I was hired to go to Brazil on 2 different occasions to train and help open that country's first ever American-Style Barbecue restaurant. I have taught professional BBQ classes from Florida to Illinois to hundreds of people from all over the country, Canada and The Netherlands. I've been a spokesman for Kingsford Charcoal at the Daytona Firecracker 400 and the Steve Harvey Show. 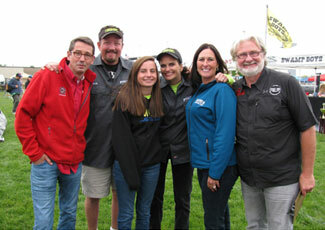 We competed in two episodes of Season 4 of the TV show BBQ Pitmasters. There are many more honors. But to wrap it up, we've been blessed.